My good friend, Anna Smith, helped launch a Pop-Up Make Cycle in CLMOOC this month that is perfectly in tune with the idea of the new year. Anna, inspired in part by a resource shared in December by Wendy Taleo in the CLMOOC ecosystem, asks us all to pause and think a bit about our digital traces and relationships with technology. Call it: Conducting a Digital Audit. Over at her blog, Anna has posted some of her questions for herself, and shared a ThingLink with various links to activities that anyone can do to audit how we are being tracked by apps and sites, how our use of technology impacts our life off-line, and more. I’ve been spending time on this topic by delving into some online reading (and in making comics — I’ll share those here another day) in order to remind myself about the positive nature of my relationship with technology, social media and the digital platforms I use. Even with the many negatives — privacy intrusions, advertising targeting, hacking possibilities, etc. — I still find plenty of positives — from connected learning, collaborative projects, writing in spaces with others, exploring art in many forms and fashions, learning together, etc. 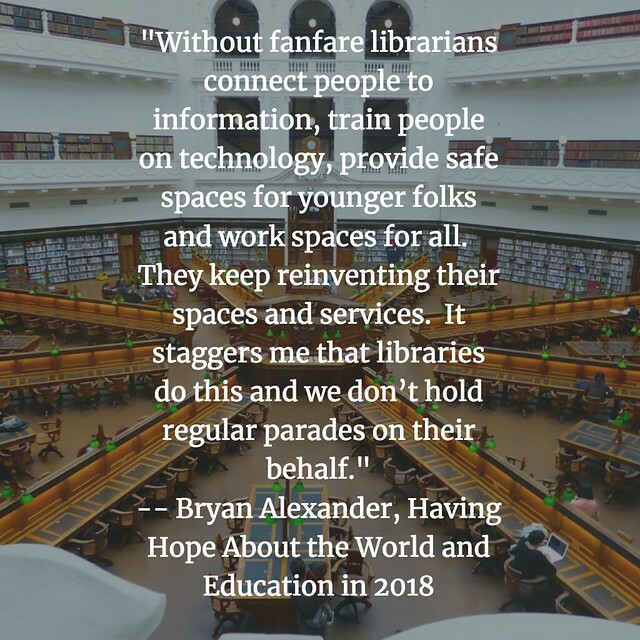 A piece by Bryan Alexander, shared in Terry Elliott’s newsletter, brought to mind the way that technology is changing the places of our learning, and in particular, our libraries. Alexander rightly praised librarians for being on the vanguard of understand and adapting to these shifts, all in the nature of helping adults and children make their own transitions into the digital world (while holding true to the values that our libraries have long represented around access and community public spaces). 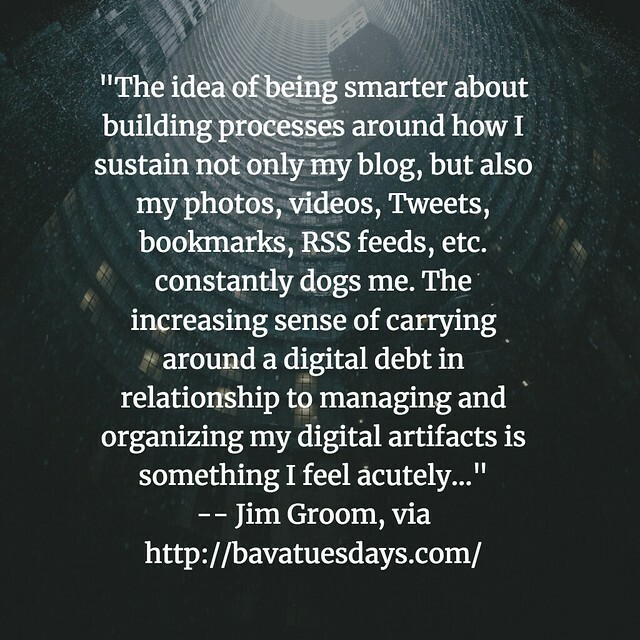 Jim Groom wrote recently about the act of archiving, of curating what we are creating in online spaces. He notes the difficulty, due to the complexity of how we share with the world, but suggests the effort to archive is worth it, as it preserves a sense of who we are now, in this moment, as well as who we were, in the moments past. Digital tools allow us to do this in ways we could not otherwise, although it takes thought and planning and an active effort. The flip side is to lose yourself in the maelstrom of media. We’re always better at finding ourself, than losing ourself. Do you watch Black Mirror? 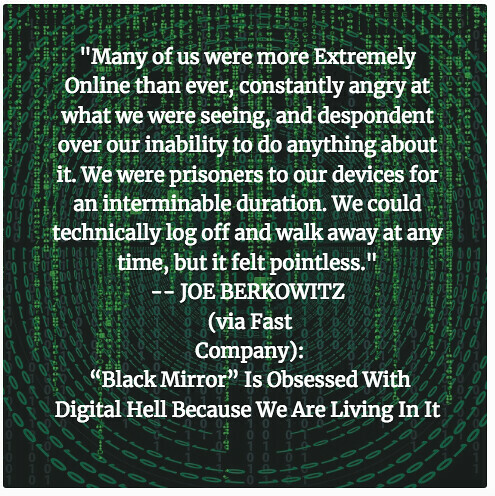 I’ve only seen a few episodes of this rather dystopian view of how technology changes us, mostly for the worse. It’s anchored on our insecurities about technology, and the ways our digital lives will overshadow our real lives, and the impact that shift will have on society and relationships. Black Mirror freaks me out a bit, so I only watch it now and then. It’s vision is so extreme that I lose my faith in the possibilities. 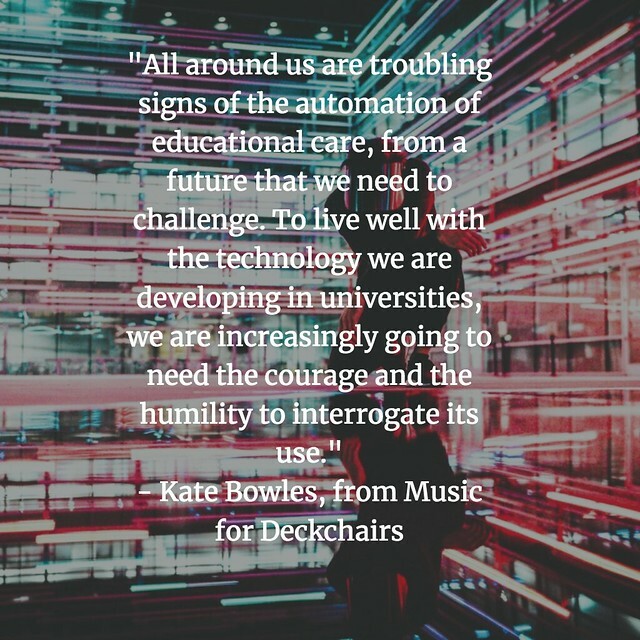 A piece from some time back by Kate Bowles reminds us not to be drawn in by technology, particularly when it comes to educators who hold the door open for young people. She notes that many companies are pulling out the stops for a chance to market to our students, and schools and universities have an obligation as digital gatekeeper to keep the wolves at bay, as much as possible, while still harnessing the potential of technology for learning. This is often a difficult balancing job. An article by Andrew Sullivan caught my attention this week, as if by chance. 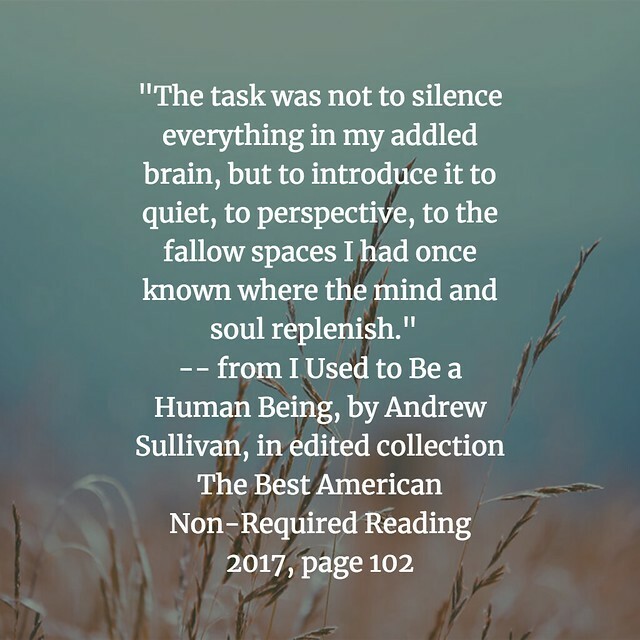 I am reading Best American Non-Required Reading 2017 (which is a collection of pieces selected by high school students) and came upon Sullivan’s piece as I was thinking of Anna’s post. Sullivan explores his own efforts to disengage from his work as a digital writer, and how he had to re-learn to find the quiet and solitude of life again. He turned down the noise, and found some music again, and I think his lesson about reminding us to be human in all of our interactions — interpersonal as well as inner-personal — is valuable. It’s a powerful piece, well worth your time. I appreciated a piece by Alan Levine, who wrote about his reaction to so much worry and concern being written these days about the media landscape. Yes, some of it is real and of real concern. 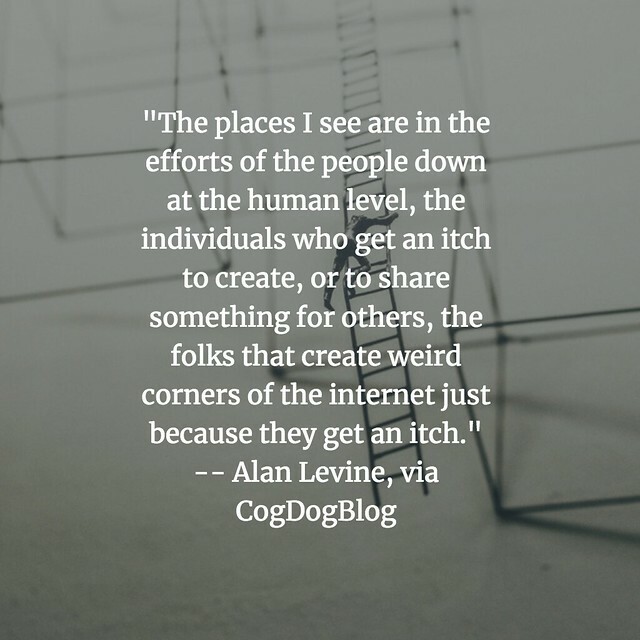 But Levine notes that much of the best of technology, and the web, is still in those strange and creative places where people come together to spark imagination, make change for a better world, and imagine a future that works for us. Levine is not being naive in his assessment. He understands the pitfalls as well as anyone else. What he holds on to, and what I hold on to, too — and what I hope you do, too — is the potential of technology to enrich our experiences, as creative artists in whatever media you dabble and as people of these places, virtual or not. Last, I’ll leave you with a video interpretation of a post by Laura Ritchie from a few weeks ago. Her piece explores musical harmony, with fingers stretched into how we learn and how we teach, and she weaves those ideas together in an enriching way. Laura’s piece reminds me again of the possibilities of being in balance with our technology and our agency in using that technology. Next week, I am going to take Anna up on some of her advice of the digital audit, and I am going to begin with Twitter. (I’ve already shut off all notifications from Facebook, where I have an account only because I administer the site for our local writing project. The amount of notifications from Facebook is staggering.) I aim to cut my follows and followers on Twitter by a substantial percentage, and try to keep true to those whose work inspires me. More may not be merrier. Also, I will probably take a blogging vacation, spending the time I usually write for this space instead with some postcards in the CLMOOC project — handwriting notes and poems and whatever to individuals in the CLMOOC community, honing in on the personal connections that make the online connections so powerful and enriching. What a fine constellation of quotations and themes. Thank you for including mine among them. I feel some of Jim’s burden, but what Alan sees makes it light. I’m constantly amazed by how you find the time to create articles like this. Each person you pointed to was someone you had to follow and read in order to capture a quote for your graphic and to summarize in the paragraph below. I hope you don’t stay away from your blog for too long. I point to what you write so others can learn and be inspired as i have been. Thanks for your thoughts, as always. As you know, the “digital audit” reverberates for me at this time. I wish you well on the journey! – you convey an insistence on looking for positive potential in technology, while understanding the role you play in educating students about the web. – you’ve identified a project and a community that interests and fulfills you in the #clmooc postcards. By devoting your time there, you brighten people’s lives and their social media feeds. I’ll be interested to follow what you find with your audit, and I hope you have a great blogging vacation! I admire your prolific output and am inspired by fellow educators & their journey. I understand the need to cull digital connections. Hopefully, I will not be the one of the ones you are removing/ unfollowing.